What is that hooting? Is it an owl calling in the middle of the day? In the spring, male mourning doves (Zenaida macroura) perch high, puff their throats and make the deepest loudest sound possible for a bird so small. The first rising note is lost in the distance, but the last two or three low notes carry far. Last week at Moraine State Park I was momentarily transfixed when I heard “Hoooo Hoooo” across the valley. When I paused to listen I realized that the cadence didn’t match any local owl. Not the great horned owl. Not the barred owl. I heard only two notes but they were spaced like the mourning dove’s. 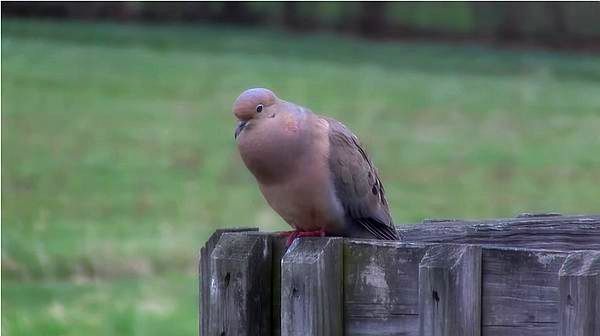 Here’s a mourning dove trying to attract a mate (YouTube video by jkontrab). Don’t be fooled when you hear this Hoooo-ing sound. It’s just a lonesome dove. I have 2 doves in my yard and they make the same sound. Both males? Judith, yes, the singers are male.